A follow-up to the highly praised Poets Teaching Poets, Daniel Tobin and Pimone Triplett's Poet's Work, Poet's Play gathers together essays by some of the most important voices in contemporary poetry: Carl Dennis, Stephen Dobyns, Tony Hoagland, Heather McHugh, Ellen Bryant Voigt, Eleanor Wilner, Dean Young, and the late Larry Levis and Agha Shahid Ali. Lively, accessible, and erudite, the pieces range from discussions on syntax and the syllable to an exploration of the complexities of canon formation under the shadow of imperialism, race, and history. Exploring the work of John Donne, William Butler Yeats, Robert Frost, Philip Larkin, Charles Olsen, Ezra Pound, Anne Carson, Robert Herrick, Harryette Mullen, and many others, Poet's Work, Poet's Play ---like its predecessor volume---will be an invaluable tool for teachers, students, and poets at every level. 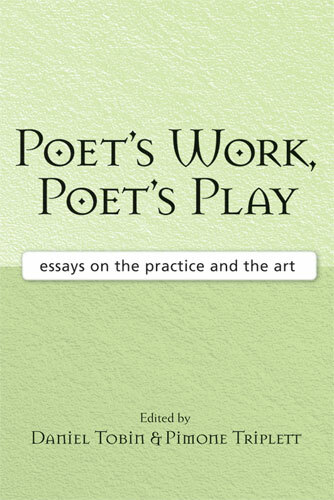 "Much more than a set of essays on poetic craft or aesthetic understandings, this collection takes on two of the most prevalent anxieties about writing poetry in our time: the place of subjectivity in poetry, and how to make a significant shape in language while both affirming and interrogating the poetic I's authority. This is a book for anyone who wants to write better poems, who wants to read with greater passion, and who believes that poetry is an independent category of human consciousness that can be as capaciousness as the world, and as nuanced." "A valuable document illuminating critical aspects of the contemporary American poetry scene." Daniel Tobin , Chair and Professor in the Department of Writing, Literature, and Publishing at Emerson College, is the author of poetry collections The Narrows, Double Life, and Where the World Is Made. Pimone Triplett is the author of the poetry collections The Price of Light, winner of the Levis Poetry Prize, and Ruining the Picture, which won the Hazel Hall Poetry Award. She currently teaches in the Creative Writing Program at the University of Washington. "Gathering together essays by unquestionably important poets, Poet's Work, Poet's Play has immense pedagogical value in the way it demonstrates how to discover in poetry resources of language and structure often overlooked in first, and ensuing, readings of complex texts. This is a worthy successor to Poets Teaching Poets. I benefited from the persuasive discoveries in each essay." "This sequel to Poets Teaching Poets is a valuable document illuminating critical aspects of the contemporary American poetry scene." "Much more than a set of essays on poetic craft or aesthetic understandings, this collection takes on two of the most prevalent anxieties about writing poetry in our time: the place of subjectivity in poetry, and how to make a significant shape in language while both affirming and interrogating the poetic I's authority. This is a book for anyone who wants to write better poems, who wants to read with greater passion, and who believes that poetry is an independent category of human consciousness that can be as capacious as the world, and as nuanced." Copyright © 2008, University of Michigan. All rights reserved. Posted December 2007 and June 2008.